The Fraser Institute awarded Barrick Gold chairman Peter Munk its T.P. Boyle Founder’s Award at a gala dinner in Toronto in 2010. This is the think tank’s most prestigious award, which it gave to Munk “in recognition of his unwavering commitment to free and open markets around the globe and his support for enhancing and encouraging democratic values and the importance of responsible citizenship.” Equating “free and open markets” with “democratic values” is a long-standing neoliberal marketing mantra. It also epitomizes Munk’s vast charitable giving. Munk doesn’t make the list of the hundred wealthiest Canadians. That means he’s worth less than the entry level $725 million. The 87-year-old Munk leveraged Barrick into the world’s largest gold producer and remained the company’s chairman until retiring in 2014. He owns less than a quarter of a per cent of the company’s shares. And yet some still call him a billionaire. Whatever his net worth, Munk is making effective use of his fortune to advance his name — Peter Munk Cardiac Centre, Munk School of Global Affairs, the Munk Debates — and his ideology — the unfettered free market. But while one initiative is high profile, the other is buried. Munk has pumped $160 million into “good works,” as well as more dubious activities through his two foundations. The good works are funded by the Peter and Melanie Munk Foundation. At the top of the list is the controversial investment of $35 million in the Munk School of Global Affairs at the University of Toronto. The deal was controversial because Munk received a $16-million tax reduction. His net $19-million investment turned out to be less than 20 per cent of the total cost, according to Linda McQuaig and Neil Brooks in their book, The Trouble with Billionaires. Taxpayers footed the bill for the rest, but had no say in naming the school or even in determining its policies. Munk got a major facility named after him and, according to the secret agreement with the university, would get to approve the school’s direction and scholarship. Munk’s high-profile naming activities receive accolades in the corporate press. The donation “merited a fawning front page news story in the Globe and Mail,” McQuaig and Brooks observe. The Globe also staunchly defends Barrick’s dismal environmental and human rights record in South America, Africa and the Philippines (see here and here, for instance). But all corporate media, the Globe included, are strangely silent when it comes to Munk’s donations to ideological causes. No corporate news organizations are following this money. Munk’s second granting organization, the Aurea Foundation (“golden” in Latin), is responsible for the rest of the funding. Aurea grabbed public attention as sponsor of the Munk Debates, which pit high-profile liberals against conservatives to debate controversial topics such as: “I would rather get sick in the United States than Canada,” “Climate change is mankind’s defining crisis and demands a commensurate response” and “Foreign aid does more harm than good.” The debates elevate conservative positions to parity with long-standing liberal viewpoints, crowding out progressive ones. As to how seriously Munk takes these debates, consider the November 2013 question, “Be it resolved men are obsolete.” The Toronto Star‘s Jennifer Wells found this topic a bit hard to stomach when she looked at the make-up of Barrick’s board of directors: 12 men and one woman. And not just any woman. Dambisa Moyo is a neoliberal economist who must have caught Munk’s attention when she spoke for the affirmative in the Munk debate Foreign aid does more harm than good. Barrick had no women at all on its board at that time. Her message of investment, not aid, would likely be well-received by the all-male board. The debates also mask the foundation’s more financially significant activities: doling out nearly $2 million a year to Canadian right-wing think tanks and advocacy organizations. Major recipients (2007-2013) include the Frontier Centre for Public Policy ($1.5 million), Canadian Constitution Foundation ($967,000), C.D. Howe Institute ($885,000) and Macdonald-Laurier Institute ($600,000). The Fraser Institute received nearly $2 million from Aurea and Munk foundations. Most funding recipients don’t disclose where their Munk money goes. We can peek into this shadowy world at the Fraser Institute, where Munk money supports the economic freedom of the world project. The purpose of this project is to “prove” that economic freedom (and the free market) is more important than political freedom (and democracy). Freedom to mine should come before the rights of indigenous people. And the Fraser Institute can provide evidence for this. Aurea also pays for the Fraser Institute’s Global Centre for Mining Studies to conduct research to “educate the public on the role that the mining industry plays in the prosperity of economies in Canada and in the developing world, and about the social and environmental effects of exploration and mining investment,” which, predictably, will be found to be minimal. – Ken Whyte, who moved from editor of the National Post, to editor and publisher of Maclean’s, to president of Rogers Publishing, to president of Next Issue Canada, Rogers’ online magazine service. – Media pundit Andrew Coyne, whose Postmedia columns reach a nation-wide readership of 1.1 million. That most arm’s-length Aurea directors are connected to the news media indicates that Munk considers it crucial to fund organizations adept in receiving good media play — without divulging the source of the funding. This direction was reinforced in 2013, when Munk hired Rudyard Griffiths as president of both foundations. Griffiths had run the debates, leveraging maximum mileage from very little. He’s a long-time participant in the conservative propaganda wars as a co-founder and executive director of the Dominion Institute. 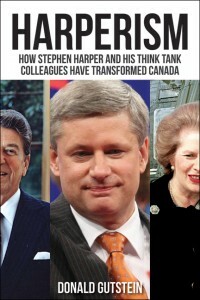 The goal of this organization was to challenge the prevailing social-history approach taught in most schools, which emphasizes race, ethnicity, gender and class, and to replace it with the story of great men and important wars and events, an approach that fits comfortably with Stephen Harper’s agenda. Griffiths is taking over a smoothly running operation: from Munk and his free-market ideology, to Aurea, to right-wing organizations that produce reports and engage in activities that further the conservative agenda, to positive reports in the corporate media. And no one is the wiser.